The story starts on a steamboat on the Mississippi wherein the narrator is reflecting about the nature of the people he meets onboard. The narrator introduces use to the Big Bear of Arkansaw, a man who has all sorts of stories to spin. Some question the veracity of his tales but he insists on their truth. He explains that Arkansaw is a wild place where things are bigger and stranger than the rest of the US. Eventually, the story turns to a "big fish" tale about a bear that he hunted for several years. At one point, he thinks he has killed it but realizes it isn't the bear he was after. 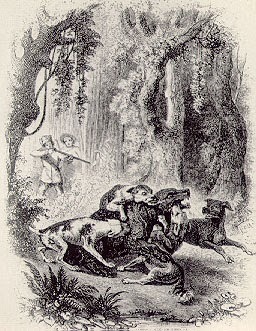 Shortly after, he has a final confrontation with the bear but rather than being able to kill the bear himself, the bear dies, leaving the man disappointed about not being able to claim it as his own kill. I often enjoy stories like these that are voyeuristic in nature (that is, the narrator watching the event of storytelling take place) coupled with a character spinning tales. A story about storytelling is in fact providing commentary about how we create and communicate stories and so valuable to any of us interested in this vein. It's probably why I like The Celebrated Jumping Frog of Calaveras County by Mark Twain so much among other similar tales as well as epistolary tales. Side note: This selection of stories was read a few months back but I wanted to not post them until after they were covered in the course I was teaching that included them. Source: The story can be found online for free at this site.